Lama Zopa Rinpoche outside the Parliament after being awarded the Order of the Polar Sta. From left: Khulan Dembereldorj, Director of Enlightening Mind; Dr. Dulmaa Power, COO of FPMT Mongolia; Lama Zopa Rinpoche; Ven. Sangpo, second attendant to Lama Zopa Rinpoche; Ven. Roger Kunsang, CEO of FPMT and main attendant to Rinpoche; Haatanbaatar, Director of UB. 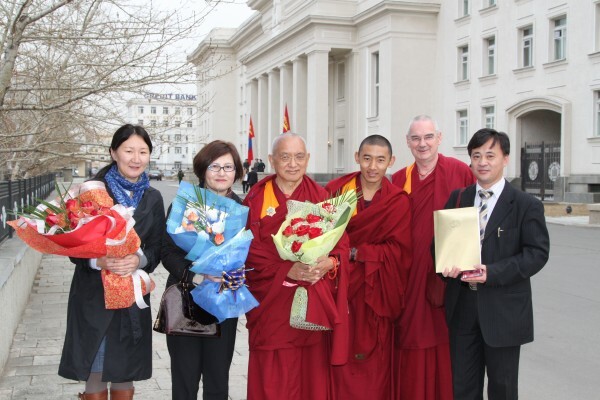 In the fall of 2010 Lama Zopa Rinpoche spent one month in Mongolia, engaging with characteristic vigor in a host of inspiring, beneficial and groundbreaking activities. Mandala is pleased to offer you an overview of Rinpoche’s recent visit to this fascinating country, details of an historic conference on the future of Mongolian Buddhism, news of Rinpoche receiving an award from the President of Mongolia in recognition of his work to spread and preserve Tibetan Buddhism in Mongolia, and information on the many initiatives which Rinpoche has started or plans to begin in this country which is now emerging from 60 years of communism as a potential stronghold for the preservation of the Mahayana tradition….